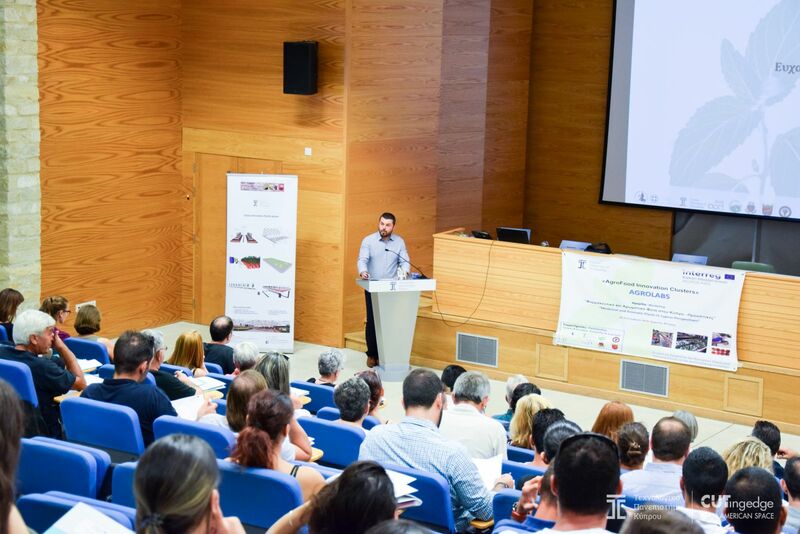 “The Workshop on “Medicinal and Aromatic Plants in Cyprus- Perspectives” was successfully held on Wednesday September 26 2018, within the framework of the AgroLabs “AgroFood Innovation Clusters” Project, by Cyprus University of Technology (CUT) (PP3 in the Project) with more than 140 participants. AgroLabs aims to foster the production and distribution of innovative agro-food products within the framework of “B a l k a n - M e d i t e r r a n e a n”, by organizing local value chains, supporting medium-sized enterprises and producers in their development projects and creating new markets for their products. The event was initiated with a welcoming message by Professor Andreas Anayiotos (Rector of CUT), where the need for research and dissemination of information from research programs and the role played by CUT was highlighted. CUT leads as a new and constantly evolving University with international recognition. Then, the organizer of the event and Scientific Coordinator of CUT for AgroLabs, Assistant Professor, Nikolaos Tzortzakis, briefly mentioned AgroLab’s objectives and actions. This was followed by a total of 9 talks/lectures by Dr. Kyriaki Zannettou-Panteli, Dr. Vassilis Litskas, Mrs. Rea Vassiliou, Dr. Spyridon Petropoulos, Dr. Silvana Nicola, Dr. Antonios Chrysargyris, Dr. Maria Konstantopoulou, Mrs. Panayiota Xylia and Dr. Eleni Skaltsa on issues of recognition and proper/controlled collection of Medicinal and Aromatic Plants (MAP), endemic plants in Cyprus, current situation and problems of producers and traders of MAP, traditional and intensive cultivation systems for MAP, quality of essential oils, uses against pests and mosquitoes, possibilities and prospects for exploitation in the pharmaceutical industry and cosmetics. A public reception and discussion were followed. A lot of attention and identification of MAP collected in the countryside is required. The indiscriminate collection of MAP degrades the biodiversity of a region. Cyprus has a rich biodiversity in MAP and actions should be performed for the reconstruction and preservation of MAP. A medicinal plant is not always an aromatic plant and vice versa. Pharmaceutical and cosmetics industries require products and essential oils of stable and controlled composition, minimizing the batch to batch variation. The uncontrolled collection of MAP in the countryside does not lead in this direction. Producers face problems for the proper cultivation and utilization of MAP. The applications of MAP cultivation are numerous, enabling market expansion and utilization thereof. Intensive cultivation systems of MAP, including hydroponics, can utilize non-fertile soils, while saving water and fertilizers and improving and controlling the quality of MAP and their products.